I’m sure most of you have seen that General Mills has been giving out free wild flower seeds in order to help save the bees. The long and the short of the issue is this: Handing out free seeds doesn’t make up for the refusal to stop using the chemicals that are killing bees in the first place. Let’s back up and look at what glyphosate is. Otherwise known as RoundUp, glyphosate is an herbicide created by a Monsanto chemist John E. Franz in 1970 and was marked in 1974. Glyphosate is such a strong herbicide that it was also harming crops. This stemmed the research and funding for genetically modified plants that could tolerate the chemical in order for farmers to spread massive amounts of the toxin on their crops, killing weeds and not harming the crops at the same time. Eventually bio-engineers began designing “RoundUp Ready” crops which are now used extensively in the US and in a few other countries. The severe drenching of fields with glyphosate and the engineering of glyphosate into crops has not been studied in full, but the amount of glyphosate “leeching” into honey is alarming, especially given that glyphosate itself has yet to be cleared of possibly be a carcinogen. The EPA is currently researching this risk, but results won’t be available until sometimes this spring, at the earliest. Coincidentally (or not so), studies have also shown that glyphosate has drastically impacted bees’ memory abilities, hampering the ability to find food and return to the hive, and their appetite, leaving them starving while producing low amounts of honey and with no drive to collect pollen, which in turn means low pollination levels and poor crop yields. 1. The seeds are not marked as non-GMO/organic, which means there is a very good chance that they also contain glyphosate. Planting poison not marked as poison is still poison. 2. Seeds listed in the package are considered invasive in certain areas. The company’s response to this essentially equated to, “There’s still pollen, and that’s what the bees need.” Introducing invasive species only presents other problems. Please check the label carefully to make sure you’re not causing more harm! (For example, Forget-me-nots and California poppies – both in the mixture – are very invasive weeds in certain growing zones. 3. These seeds are not a promise from the company to end the usage of glyphosate. Anyone who has taken Advertising 101 or a comparable course can tell you that this is a “feel-good” campaign in order to raise customer satisfaction and to distract from the new information surrounding the weed killer General Mills uses on the grains that eventually become their cereal, which we in turn feed to our families. If you would like to plant flowers for the bees, by all means, do so! Fantastic lists of native plants to grow that will help increase pollination and bee populations can be found at The Xerces Society. Make sure that the seeds you are buying are from a reputable dealer who does not sell GMO seeds, or if they do, make sure it is from a seed company that clearly labels what seeds are GMO and are non-GMO. 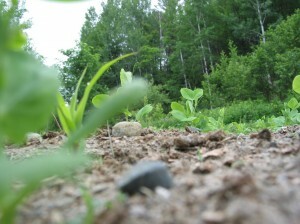 One great example of a company practising such transparency is FedCo Seeds here in Maine. Everything is clearly labelled in their catalogue and online. Buy from local seed dealers who will know what will grow well in your area. Aim for native plants if you are planting only wild flowers. Grow non-GMO, organic crops if you are gardening. Do good, but don’t by into the “feel-good” of a company trying to undermine you.